This annual celebration of freedom is, unfortunately, the day when most pets go missing. Here are four quick tips you can take to ensure your dog's safety and comfort. 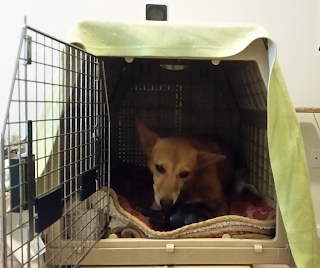 Dog relaxes in muffled crate with music playing and a bully stick tripe KONG Extreme dog toy. Make sure that your pet is indoors and secured before opening any exterior door, even to take a peek outside. This can be in the pet's bedroom or in a crate or kennel. Be mindful of open windows, and definitely don't trust your backyard fence or your drunk best friend to contain your dog, no matter how trustworthy they normally are. In addition to covering your dog's crate with a sound-dampening moving blanket or acoustic foam, leave the television, radio, or a music track running on a loop so that the blasts aren't as prominent. Tchaikovsky's famous 1812 overture is a favourite around here because it includes volume and texture changes (including cannons) and is heard enough throughout the year that we can be certain it won't provide any startling of its own. Start playing the music while nothing else is going on (i.e. not immediately before or after crating your dog). Dogs with genuine anxiety or fear of fireworks may go into a state of panic no matter how pleasant and protected you try to make the environment. Talk to your vet about medication options, as well as a long-term treatment plan to reduce anxiety for subsequent years.